Do you know that a bunch of pinholers from USA, Europe and maybe other places are going to meet for WPPD 2015 in Portland Oregon? Yes, we/future is perfect - thank you so much! I love seeing more of the sun reflection than the actual sun. Adds to the dark mystery here. 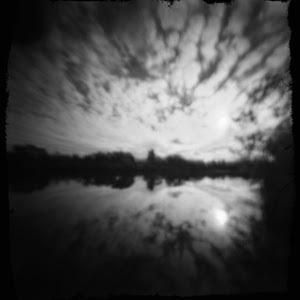 You do splendid work with your matchbox pinhole! Thank you so much, Eleni! You inspire me to get out there with it.